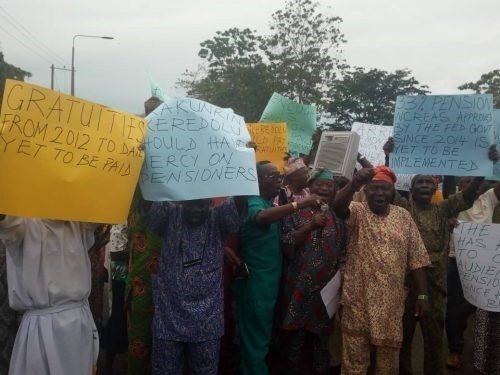 Ondo State workers and pensioners protest at governor's office. One of the pensioners who identified himself as Mr. Biodun Abidakun said several of them have not received their pension in the last one year. The seat of power in Ondo state is currently under siege. Workers in the state have allegedly shut down official activities in the governor's office, Alagbaka Akure in protest over their unpaid backlog of salaries, pensions and bonuses. While the protestants were noticeably chanting solidarity songs with various inscriptions on the displayed placards, the union leaders reportedly marched into the offices, dispersed workers and locked their offices. The protest is coming after the expiration of the deadline given to the state government to clear all the backlog of debt owed the workers and pensioners across the state. Speaking on the condition of anonymity, an accounting officer in the protocol and admin department narrated how she and her colleagues were chased out of their offices. "Yes, we were chased out of our offices. We resumed to commence our usual reconciliation of accounts and payment of approved money when the union leaders arrived and ordered us out of the office. "While we were trying to ask questions, they were already locking the doors. We had to quickly pack our bags to avoid being locked up. The anger was boldly written on their faces and it was obvious they meant business with the government." "We have written several letters to the state government. What they kept telling us is that it will be paid once they receive the next tranche of Paris Club refund. "In the last one year, we confirmed the state has received nothing less than three different refunds from the Federal government excluding the regular monthly allocations. Why have we not been considered for just a month or two? "We can't continue to be dying in silence. Many of us are already dead of curable illness but because there was no money to take care of hospital bill, their family watched them dead some are currently dying in the hospital." Attempt to get across to the state commissioner for information was unsuccessful as our Bounce News correspondent gathered that the commissioner, and some other state executive members were on the train of the state governor to attend the inauguration of the incoming Ekiti State governor, Kayode Fayemi.